I hate to interrupt the festive mood of the Romo/Glenn meltdown, but there's tragic news in the world of college football tonight. 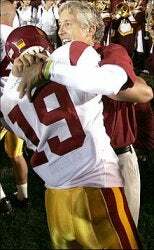 Mario Danelo, kicker for the Rose Bowl champion USC Trojans, has been found dead. There are no further details available as of 11:45 pm on Saturday, but his body was found at the bottom of a cliff in San Pedro, California. Danelo, 21, was a redshirt junior for the Trojans. His father Joe played in the NFL with the Bills and Giants.